Written by michael. Posted on September 11, 2009. Filed under Other. Tagged Bad Veins, Chromeo, Chuck Roy, Cotton Jones, Cymbals Eat Guitars, Deer Tick, French Horn Rebellion, Girl Talk, Health, M. Ward, Mars Volta, Method Man, MF Doom, Monolith Festival, Morrison Colorado, MSTRKRFT, Neon Indian, Of Montreal, OK Go, Passion Pit, Phoenix, Red Rocks, Savoy, Speakeasy Tiger, Starfucker, Thao With The Get Down Stay Down, The Antlers, The Dandy Warhols, The Twilight Sad, The Walkmen, Yeah Yeah Yeahs. No comments. If you’re not going to Monolith Festival at Red Rocks this weekend, you should be. Tickets are still only $110 for a 2-day pass. If you can’t go, watch this space — we’ll be blogging the festival all weekend long with pics, vids and more. Of course, the two acts I’m most excited to see Saturday — The Walkmen and M. Ward — are crunched together at 5:30 and 6:15. 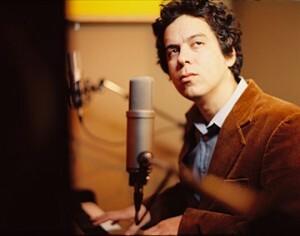 M. Ward is songwriting genius. He has such a classic sound with a modern twist and if Letterman appearances are anything to go by, dude-man is t-riff live. The Walkmen look good live so I’m super-excited to hear Hamilton Leithauser wail his best Bob Dylan-shout-o and Matt Barrick’s stupid-crazy-awesome drumming echoing across the mountains. It seems like everybody’s looking for ways to look or sound vintage these days with all the crazy hyper-perfection available with modern technology everywhere. With Cotton Jones, this is not a contrived gimmick. They’re wonderfully authentic and down-to-earth. 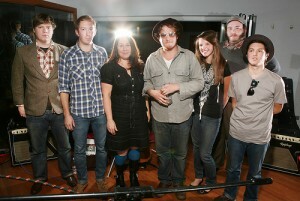 Catch them at the WOXY.COM stage at 7 p.m. If Cotton Jones isn’t your thing, head up top, grab a drink and check out Denver-based comedian Chuck Roy with MF Doom at 7 p.m. on the Southern Comfort Stage. Chuck is absolutely hilarious if you haven’t already seen him on Last Comic Standing, Will & Grace or in town at Comedy Works. Oh yeah, and MF Doom is awesome too. I intend to spend the rest of the evening stalking Karen O of the Yeah Yeah Yeahs cos she’s purty. 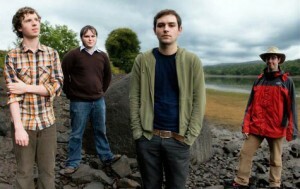 The Twilight Sad: Scottish rockers. I’ll be parked in front of the WOXY.COM stage for most of the afternoon. I already talked about catching the mysterious dream-dance-disco-pop of Neon Indian at 3 p.m.
Cincinnati-based Bad Veins play at 4:20 p.m. Their songs are awesome pop anthems and I’ve seen them live while going to school near Cincinnati, definitely original and creative instrumentation. If you haven’t heard of them, trust me — they’re worth a look. A friend shot me some tunes from The Twilight Sad a few months ago. I neglected to listen but on a whim threw it on a few nights ago when I found out they were going to be at Monolith. I am *SO* glad I did. These Scottish rockers are a throwback to Joy Division, The Smiths, My Bloody Valentine — the dark, brooding glory bands of British 80′s. Their sound is huge, noisy, but melodic and I’m definitely excited to sneak a glance at some pedal boards before getting my face melted off. When you have to choose between Passion Pit, The Twilight Sad and French Horn Rebellion, you know you’re at a good festival. See you there. If not, see you here afterward for reviews. Woo! 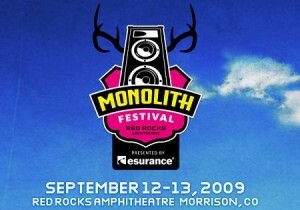 My first concert in Denver was last year’s Monolith Festival at Red Rocks. A month after the hot schweaty mess that was Lollapalooza, it was easy to fall in love with an inexpensive festival with perfect weather, a gorgeous natural backdrop, five stages within a 5-minute walk of one another (as opposed to 20-40 min. navigating a sea of plaid at Grant Park for Lolla) and plenty of pleasant surprises (Port O’Brien, Cameron McGill and What Army). That’s why I’m so very stoked for Monolith Festival this weekend. Lots of great acts, lots of smaller bands I’m excited to check out for the first time. And for a 2-day festival that cost $75 at it’s initial price — W-O-W. You can still get 2-day tickets for $110 here … still a great deal.